The promotional Petite designer bar two pack is quality all the way. Grab yours and brand it up today. These promotional Petite Designer Bar Two Pack gifts may look small in size, but they are big on flavour! 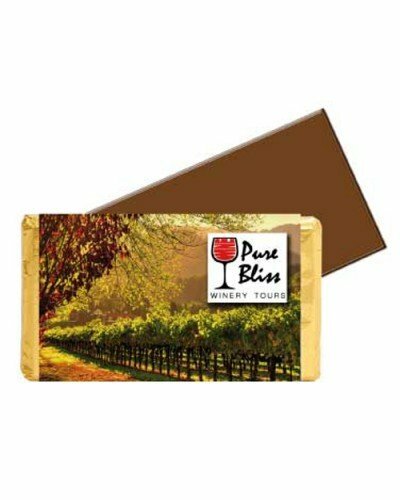 These luscious and delicious bite-sized chocolate bars make the perfect giveaway for your next event. It can easily be handed out on tradeshows, product launches, store openings, or any event there is. Alternatively, it makes great gifts to your loyal clients and hardworking staff. Two pieces of 40mm x 40mm personalised Petite Designer Bar Two Pack chocolates sit side by side, packaged in a clear acetate box. The chocolate bars are covered in foil, in any colour you choose. Then, is wrapped with custom printed premium paper to showcase your brand or logo. You may choose to add on ribbons and embellishments to make these sweet treats gift-ready. 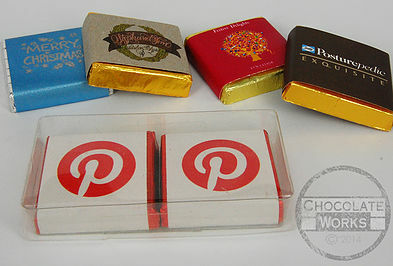 We also have a Four Pack option, if you think the branded Petite Designer Bar Two Pack is too small. For loose pieces that can be easily handed out on large events or placed in serving bowls on your next conference, may we suggest the custom Petite Designer Bar. 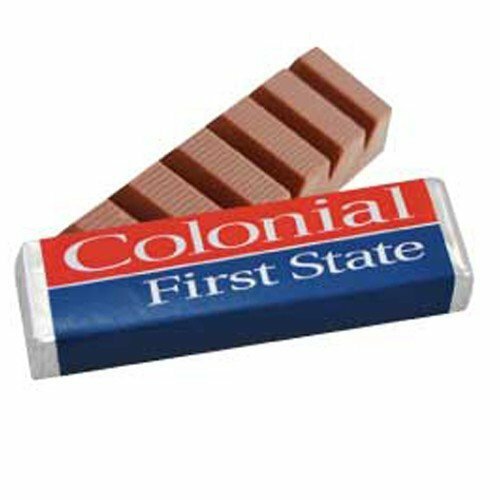 Same branding opportunity, same great chocolate goodness, sans the acetate box. Check out also our wide selection of Personalised Chocolate Bars, to give your more options for your promotional products. Shall we get started on your order? Reach out to us via the live chat that just pops on your screen when we’re online. In case it’s beyond office hours, we will get back to you the moment we arrive. You may also reach out to us via our hotline – 1300 008 300. Confectionery experts are always willing to give a helping hand. To further expand your branding opportunity, we’d like to invite you to our Fast Caps section, where you can promote your brand with non-consumable goods such as caps, customised with your logo. You can start your search with promotional baseball caps. Call us on the same hotline – 1300 008 300 – and let’s maximise all avenues to expose your brand more. Standard or customised chocolate bar presented in foil and premium papers with custom print with optional embellishments and ribbons. Packed in clear acetate box of 2.